I pinned this and you guys immediately begged me to try it. The thing is, I probably could have written this post without even trying it at all because it turned out pretty much exactly how I thought it would. But then you would have missed out on the pictorial version of the process. On a dark and stormy afternoon, one Pintester emptied a packet of Crystal Lite (because she’s on a diet, duh) into a cute little tiny ramekin. Then she stuck her finger in it, which is pretty much how all pintests begin around here. And though the valiant Q-tip tried, this pintest was really too far gone to save. Oh dear. And, to add insult to injury, it did not stay where it should have stayed. On my finger? Yes. On my lips? No. Know what, though? This tale has a happy ending, because then I ate the rest of the Crystal Lite powder like a Pixie Stick because, damn, it feels good to be a gangster. Also, it did stain my tongue. Oh irony, how you mock me! 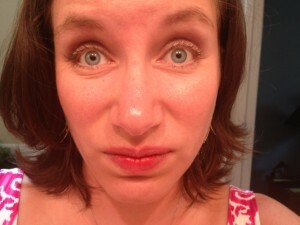 Am I the only one who is seriously creeped out by the lips in the pinned picture? I don’t know what it is…I cannot stop looking at them! AAh! ehuffman nope. 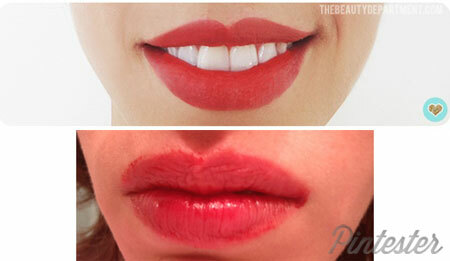 I’m freaked out by them too I think it’s cause no one has lips that look like that. They are too full. They look photoshopped to me. Plus it’s a creepy smile. courthal1 YES! And the teeth are too perfectly white. Love it! This is exactly what would happen if I tried it! Ever try coloring your hair with it, yeah, pretty much same result, was super awesome when it started raining and kool-aid was running down my face! Sometimes I think people post stuff that doesn’t work just to see how many other people are crazy enough to try it. Thanks for being one of those crazy people and saving the rest of us from the mess and embarrassment! 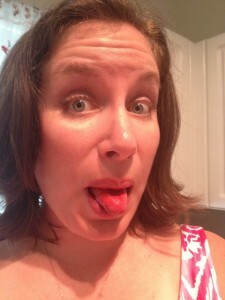 I’m one of the morons who re-pinned the KoolAid lipstick pin. Thanks for trying it so we don’t have to – and for making hysterical faces! Ok, but Crystal Light is not the same as KoolAid. I’m just guessing here but maybe KoolAid has some color additives that Crystal Light doesn’t have? So who knows, it MIGHT still work… if you use the right ingredients. LauraContreras It doesn’t. I’ve tried it with cherry Kool-Aid. Name brand and everything. While delicious, I found it uncontrollable and sticky. It ran ALL over my face. Even tried it is a thick paste. This pin was just not meant to be my friend. I don’t care if these pins Might have worked or not. See your blog about the failures always makes my day. Thanks for another great laugh at your expense. ROFL! But hey, I’m laughing with you! I pinned this and tried it a few days ago thinking it would absolutelywork. 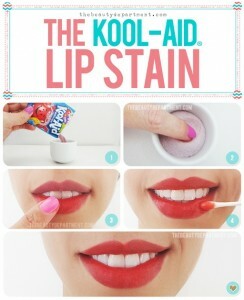 I mean, kool aid powder stains your boogers if you accidentally inhale while making it, so why not lips! It did work, a little too well. Apparently the scratchy citric acid grains in the mix act as an exfolliant so I walked around all day with red pieces of skin hanging on my lips. I’ll just stick to red sharpie like a normal 6 yr old, Thank you very much! Ha! Better you than me. I was going to try this one. @Chloe_lala thanks for the share! @chloe_lala If it’s weird, please never be normal. 😉 And thank you! I knew someone who thought it would be fun to snort a blue pixie stick in class….maybe this is where this pin originated from? She was expelled from school with a blue nostril, had a couple offspring and never left that town. Given the two choices, I’ll try this one…if any. When I was a teenager, my sister and I used to use unflavored red Koolaid to dye our mother’s boyfriend’s white cat pink. Good times. “This tale has a happy ending, because then I ate the rest of the CrystalLite powder like a Pixie Stick because, damn, it feels good to be agangster.”DYING. I’m the idiot who tried it one day since we have way too much Kool-Aid in the cabinet….but I just used a regular pack since I didn’t see anywhere in the pin that you should use the sugar-free version. Anyway…as you probably know, Kool-Aid is NOT good without sugar. Ugh. But at least it stopped me from licking my lips. Also, this is not good to try with super chapped lips. Insert burning fire from hell. Idk what you did wrong but I’ve done this many times and it works and I love it. I add kooli aid to my homemade lip balm for the color and it also adds a sweet taste and it is fabulous. Sometimes it bothers me because the lip stain last so one that I don’t want red or pink lips for days. I saw this, and even though it failed horribly for you, I had to try it. 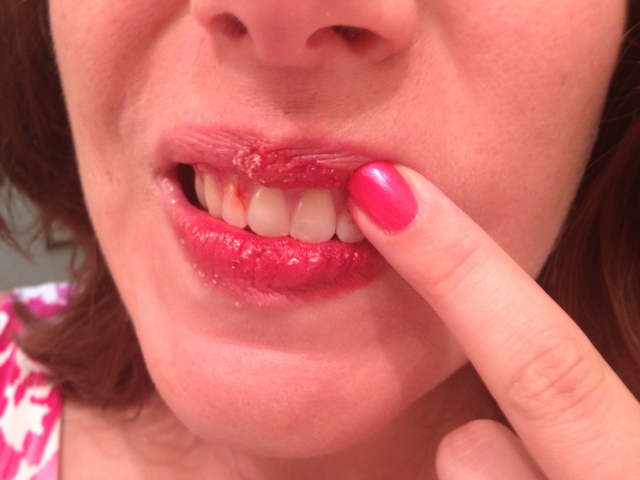 The moment I started rubbing it into my lips, I knew something was going wrong. See, my Kool aid was a bit…aged, I guess. My husband still had it from his bachelor days, so the powder was pretty grainy from absorbing extra moisture from the air. Think table salt grains. 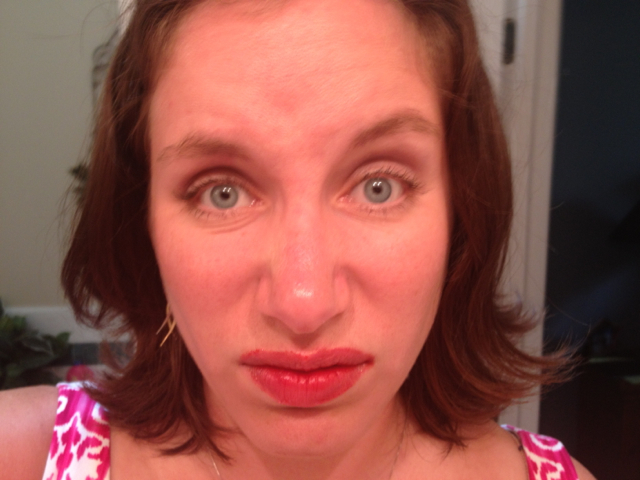 I instantly had tons of little microcuts on my precious pout, which now tasted like the saltiest cherry-flavored lemon I had ever had. Nasty, painful stuff. 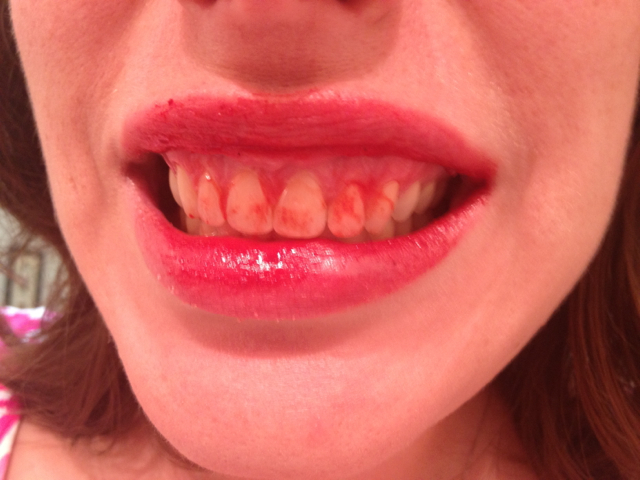 Mind you, I’m the principal French horn player for my university, so painful lips means painful playing. I was not happy. I did end up making some adjustments, though, and it seems to work well with the changes. 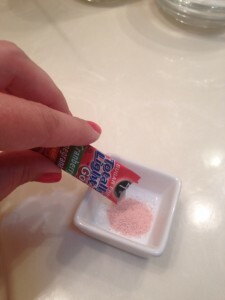 I dissolved the packet (yeah, the whole packet) in a tad bit of water and applied it with a Q-tip. This is an all around much better application than the random and painful rub-it-into-your-face-with-your-finger notion. The stain will go right where you want it to go, and I had little to no issue with it getting on my teeth. I left the stain on for a few minutes (probably between two and three minutes, to be exact) before blotting any remaining stain off with a tissue (or, in my case, toilet paper). 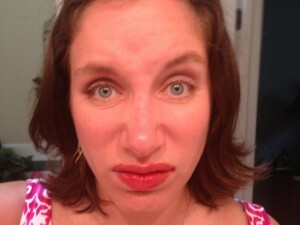 It did exactly what any store-bought stain does, and I now have some awesome cherry-red lips. They do taste pretty dang weird, though. Overall impression after the adjustments: it works great as a stain. However, don’t plan on kissing someone within a few hours of applying the stain, because they will think you just spent the last hour sucking on a huge chunk of salt and fake flavoring. I hope this helps! Also, as taybromby mentioned, never EVER do this with chapped lips. 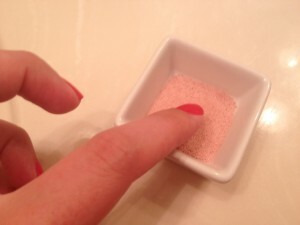 Your pout will need to be in pristine condition, or else the salt will burn your lips for more than an hour. Actually, the “burning fire from hell” seemed pretty accurate, lol!